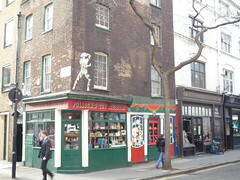 Located in a side street near Goodge Street tube is the small and quaint Pollocks Toy Museum. 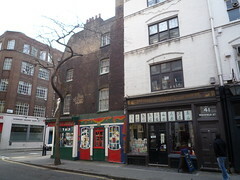 The outside of the museum and toy shop looks a little run down but the staff seemed cheery. Although that could be because we were paying £5 (adult) to enter the museum. The museum is located above the shop and via some occasionally cramped stairwells. Many of the exhibits and all of the rooms offer a synopsis of the content. Generally the displays are most suited for those of a certain age and interest in older toys. The bulk is focused on dolls and dollhouses with a few sections on games and other assorted turn of the century children’s toys. Rather incongruously we noticed in one case a Kellogg’s Rice Bubbles Box with a Phantom Menace Game on the back. While some of the pieces were interesting it wasn’t something I’d recommend unless you particularly like dolls. Nonetheless there was a stream of people coming in, mainly families with small children and retirees. Personally, I think the museum would benefit by giving up some shelf space to some more recent toys from the 60s to the present, which would help to diversify the age of visitors.